Cover image: "An artist's rendition of the InSight lander operating on the surface of Mars" provided courtesy of NASA JPL. When I first learned about the the next Mars lander, InSight, I had the nagging feeling that there was more to know about each facet of the mission--seismology, heat flow, how the instruments can in fact measure these things with incredible sensitivities... In this article, we go deep into understanding how scientists can learn about the composition of Mars's interior, and how InSight's instruments and systems work. This is the product of a few weeks of research and collating resources. Don't be fooled, it's still a summary! Click the links, watch the videos, and check out the references at the end of the article. As a bonus, SPEXcast had the opportunity to interview NASA scientists and engineers about their work with this mission, and we'll be releasing those discussions all through the month of May. Share your thoughts or ask questions related to this article on twitter @ritspex. With that out of the way, let's talk science! We've learned a lot about the history and composition of Mars from the volumes of orbital images taken by the Mars Reconnaissance Orbiter, surface geology experiments conducted by Curiosity, and the handful of other probes and rovers that made the interplanetary trip to the red planet. We know that Mars has polar ice caps, a very weak magnetic field, canyons and ravines that appear to have been eroded by ancient water flows, and massive extinct volcanoes like the largest mountain in the solar system, Olympus Mons. However, these observations only provide a limited window into the planet's past. There is still a great deal of uncertainty about the structure beneath the Martian surface, which may hold the key to answering questions we have about Martian volcanoes, Earth's inner makeup, and the formations of planets in general. And believe it or not, there have been no seismic investigations of the interior of any planet (besides Earth) since Viking and Apollo 35 years ago! Earth and Mars side-by-side (to scale). Image credit NASA. Most of what we know about planet formation comes from observations of Earth. We have all the equipment, time, and energy to investigate layers of rock formations, earthquakes, and all sorts of (basically) direct measurements of Earth's activity. In addition to canyon walls, mountain ridges, and drilling cores out of the crust, scientists can infer the interior structure of the Earth by measuring earthquakes and seeing how those vibrations propagate through the planet. While the atmosphere and oceans on Earth make it a nice place to live, they can make studying Earth's interior a bit difficult. Ocean currents, waves beating away at beaches, tides, and even atmospheric pressure systems actually deform Earth's crust by tiny amounts. This adds extra noise and complications to seismology measurements and the mechanisms they study. A couple hundred thousand miles away is another trove of information, the Moon. Astronauts of NASA's Apollo program brought samples of Moon rocks back with them, and left sensors behind to measure moonquakes. The Moon is much smaller than Earth and has a much cooler interior, and thus it much quieter seismically. Since moonquakes are rare, several Saturn V third stages and Apollo ascent modules were deliberately crashed into the lunar surface in order for the seismometers to measure how the impact waves travelled through the Moon's interior. So why go to Mars to study planetary science? It's large enough to have experienced similar activity to Earth in its early days, but cool enough so that the molten metal dynamo in its core has stopped churning. It's atmosphere is pretty thin, and there are no fluid flows on the surface to add noise to sensitive measurements. Space agencies of Earth have sent more successful missions to the surface of Mars than anywhere in the solar system besides the Moon, and have loads of analytical and experimental experience preparing systems to survive there compared to other planetary bodies. This means that scientists can engineer systems to get a very clear and precise look at the interior of Mars, and will inform our models and theories for how all planets form. I've glossed over a lot of the technical details here, but don't worry, we'll cover the science in more detail later. Before we talk about seismometers, let's make sure we understand the basic principles of tectonic activity like earthquakes and marsquakes. It all comes down to vibrations. If you put your ear to a table and tap the other side with your finger, you hear the vibrations (or pressure waves) created by your fingertip which have travelled through the solid medium (the table) to your ear. If you place a book between your finger and the table, it will sound different than before. Scientists measure vibrations in the ground and use models to determine the structure, composition, and depth of each medium (table or book) between a tectonic event (tap of the finger) and the seismometer (your ear). A tectonic event--a shift in tectonic plates, volcanic eruption, or meteorite impact--generates pressure waves (P-waves) and shear waves (S-waves) that propagate through the entire planet. The vibrations travel at different speeds through different rock densities and compositions (solid vs. liquid or iron vs. nickel, for example), and the boundary between different layers causes some of those waves to be reflected. Animations of P-wave and S-wave propagation on Earth and the Moon. Generated by Michael S. Thorne, H. Philip Crotwell, Gunnar Jahnke, and Heiner Igel of University of Utah Center for High Performance Computing. Seismometers use a mass suspended from a frame. The mass's inertia keeps it steady while the seismometer frame moves with the outside world. The relative motion between the suspended mass and the frame is what's measured. Remember that measuring the frequency of these oscillations can tell us more than amplitude alone! Geophysicist Horst Rademacher explains how a simple seismograph records the Earth’s shaking. Video credit Roxanne Makasdjian and Phil Ebiner, UC Berkeley. Additional resources to learn about analyzing seismic signals and noise. Wait, didn't Viking 1 and 2 have seismometers? Yes, but the one on Viking 1 didn't deploy at all, and data from Viking 2 wasn't clear enough to measure any marsquakes. Viking's seismometers were mounted on the deck of the lander and ended up picking up vibrations induced by winds and other vibrations carried through the lander's frame itself, which drowned out some of seismic activity that might have occurred. Read more about seismology on Mars using data from the Viking spacecraft. InSight (Interior Exploration using Seismic Investigations, Geodesy and Heat Transport) lander is a stationary laboratory that will be deployed to the surface of Mars. InSight shares its construction heritage with NASA's Phoenix lander, which descended to the Martian polar region in 2008. The 360 kg (794 lb) vehicle has three legs and two round solar arrays that open like a folding fan when deployed. From Wikipedia, "Phoenix landing site panorama. This "father" spacecraft design has many similarities to InSight. It landed in the north polar region of Mars in 2008, while InSight is targeting a zone near the equator." In 2010, InSight--initially known as Geophysical Monitoring Station (GEMS)--was one of three finalists for NASA's Discovery Program, the same program that funded the Mars Pathfinder, Dawn, and Kepler missions. In August of 2012, InSight was selected for development and launch, and construction of the lander began in May 2014. Launch was planned for 2016, but a persistent vacuum leak in one of InSight's primary instruments, SEIS, led NASA to postpone the launch until the next Mars transfer window in 2018. Understand the formation and evolution of terrestrial planets through investigation of the interior structure and processes of Mars. Determine the present level of tectonic activity and meteorite impact rate on Mars. To learn how the spacecraft will achieve these objectives, let's take a closer look at the science instruments on board. InSight carries three main instruments, a robotic arm to deploy two of them, and an assortment of other sensors and mechanisms. Above: a computer model of InSight with its payloads deployed. Image credit Philippe Lognonné and Institut de Phisique du Globe de Paris, University Paris Diderot. The Seismic Experiment for Interior Structure (SEIS) will measure minute crustal deformations on the surface of Mars. The instrument, a collaboration between the French space agency (CNES) and 5 other agencies, is capable of measuring ground displacements as small as 20 picometers (10-10 m)--smaller than the width of a hydrogen atom! SEIS is actually composed of a 6 seismometers of two different types: three very broad band (VBB) seismometers covering frequencies between 0.005 Hz and 1 Hz and three short period (SP) seismometer covering frequencies between 0.05 and 40 Hz, housed in an evacuated chamber. The sensors are used in groups of three to measure each spatial axis (up-down, left-right, forward-back) and placed as separate units in the instrument housing. What makes these sensors able to detect such fine disturbances is their low noise characteristics. Noise is the random error in a measurement, basically how accurately a signal can be measured. Any real signal smaller than the noise floor is indistinguishable from random error. To keep noise as low as possible, these instruments are kept under deep vacuum to reduce thermal energy, which contributes to noise in the electronics internal energy of the components, and gas damping, which contributes to noise in the dynamics of the seismometer's pendulum, from entering the system. Keeping the instruments under vacuum does not eliminate these noise components entirely, but the remaining amount can be calibrated out. 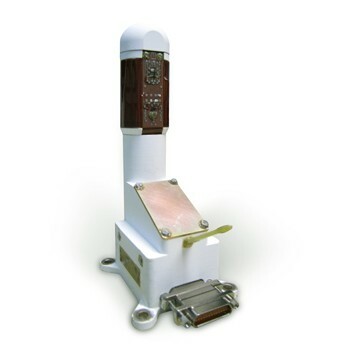 The VBB sensor is a mechanical inverted pendulum stabilized with a leaf spring. SEIS has one VBB for each axis of translation. Images credit IPGP/David Ducros. The VBB consist of a 190 gram mobile mass which only "swings" 50 microns back and forth along a lamellar, stip-type pivot, but the inherent instability due to being an inverted pendulum allows it to be sensitive to very small displacements. A semicircular lamellar provides a restoring force against the pendulum's weight, but each one is uniquely tuned to its specific VBB. As far as the sensors' arrangement, rather than having two horizontal pivots and one vertical pivot (which seems like a logical choice until you realize an inverted pendulum doesn't work as well when it's sideways...), all three VBB seismometers are placed 32.5 degrees from horizontal and at right angles to each other. This distributes the measurements, and noise, across all three axis at once, improving the instrument's overall signal to noise ratio. Read many more details on the components that make up SEIS VBB seismometers here. SP seismometers measure shorter frequencies than the VBBs and also serve as a backup for the VBBs if something were to go wrong. Images credit Imperial College London. The SP sensor is a tiny (1 gram) mass that moves laterally, etched into a silicon wafer. Position of the mass is sensed by a periodic linear capacitave array transducer. One complete SP seismometer is smaller than a coin! To protect the delicate instrument package from the elements and provide extra thermal and vibrational insulation from Martian weather, a dome-shaped shield is placed over top called the Wind and Thermal Shield (WTS) developed by NASA Jet Propulsion Lab (JPL). The shield stands separately from SEIS on three legs, and has a golden thermal "skirt" that drapes around, protecting it from all angles. The bottom edge of the skirt is lined with chainmail (yes, chainmail), which weighs down the skirt for windproof contact, even over small pebbles. The shield has been developed to withstand gusts of 60 m/s, and could potentially even survive winds of 100 m/s. SEIS is expected to run continuously for at least one Martian year (687 Earth days). The Wind and Thermal Shield (WTS) isolates and protects SEIS from the elements. Image credit CNES/GRIMAULT Emmanuel. SEIS is the evolution of Martian seismology mission concepts, including designs that led included the combined VBB and SP instrument architecture, had been worked on for Mars 96 (failed in 1996), NetLander (cancelled in 2004), ExoMars Humboldt lander (cancelled in 2009), and SELENE-2 (delayed, no target launch date). The instrument was on the ropes yet again when problems with SEIS plagued integration and testing in 2015, pushing the target launch date for InSight out of the 2016 Mars transfer window to summer of 2018. In August of 2015, CNES discovered and repaired a leak in the SEIS vacuum chamber. Another leak was found and fixed in November of that year. When a third leak was detected, CNES and NASA doubled down on investigating the problem, leaving insufficient time for the remaining integration and testing to be compatible with the March 2016 launch schedule. CNES and NASA are now confident that these issues have been resolved and SEIS is ready to go for this summer's launch. In order to characterize the geophysical properties of a planet's interior, more data is needed than seismic vibrations alone. One key measurement is the amount of thermal energy coming out of the planet. The variation in temperature with depth, or thermal gradient, is used to interpret seismic and other measurements in geophysical models. The amount of heat in the planet's interior is tied to the geological "engine" that drives tectonics and geological processes that make volcanoes and mountains. But how can we measure the core temperature without putting a thermometer thousands of miles deep? Lucky for scientists, even though the temperature variation from solar irradiance day-to-day can swing tens or hundreds of degrees on the surface of Mars or the Moon, by digging just a few meters below the surface, weather and seasonal variations no longer significantly affect thermal measurements. With temperature readings at different depths from the surface to as shallow as 2 meters, even though the readings differ by a few degrees the data can be extrapolated and combined with other measurements and models to determine the thermal conductivity and internal structure of the entire planet. Apollo 15 astronauts conducted this very experiment on the Moon in 1971 by taking temperature readings in lunar regolith at intervals up to 2 meters deep. InSight's Heat Flow and Physical Properties Package (HP3) is a clever system for measuring the heat flow of the Martian interior. Like SEIS, HP3 is separate from the main lander bus and is deployed by the Instrument Deployment System robotic arm. HP3 was designed and built by the German Space Agency (DLR) with help from NASA JPL. Troy Hudson, an Instrument Systems Engineer for HP3 on the JPL side, spoke to SPEXcast about the inner workings of the experiment, explained its scientific basis, and shared personal anecdotes of its development on an upcoming episode. You can see Troy speak more broadly about InSight and its experiments at a JPL public talk on YouTube. 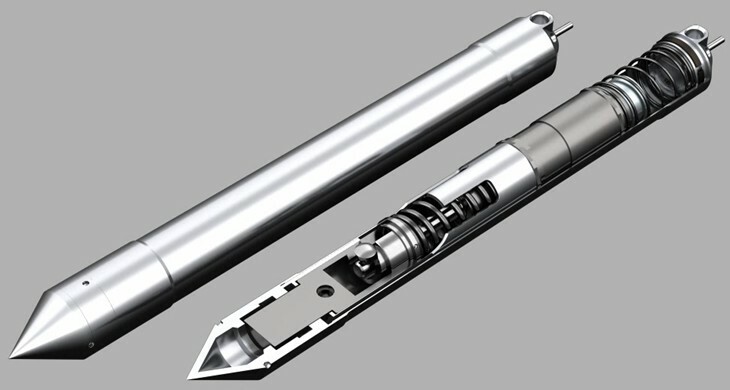 The workhorse of HP3 is a torpedo-shaped "mole" that burrows into the soil. Inside the aluminum shell, the mole has a spring-loaded hammer assembly. Every three seconds the hammer is wound up and released, driving the mole down at a rate of only a couple millimeters at a time until the mole reach its maximum depth of up to 5 meters. HP3’s slow and methodical digging mechanism is optimized for weight and power limits on the spacecraft. The mole "self-hammering-nail" architecture is better than a drill because it has a much less instantaneous power draw and does not require an applied downward force other than the pressure on its sidewalls from surrounding soil. While descending, the mole will pause from digging every 50 cm to measure the soil's thermal conductivity. The probe waits through a cooldown period of 48 hours to dissipate heat that has accumulated due to friction while digging and to let the soil return to thermal equilibrium. Heaters inside the mole's hull are activated and thermal conductivity is measured using the self-heating curve for another 24 hours. As dissipation of power in a resistor increases, the temperature of the resistor increases and causes a change in the resistance value. This effect is known as self-heating. The HP3 mole essentially uses Martian soil as a heat sink whose effectiveness is determined by its thermal conductivity. Careful modeling and calibrations of the mole's heater electronics and its own thermal characteristics allow thermal conductivity of the soil to be accurately measured. The mole is connected to the HP3 base by a tether, which carries power and data cables to the probe. 14 platinum resistance thermometers are placed along the length of the tether to measure the temperature of the soil. The mole is likely to push small pebbles aside while digging, but in case the bored path is diverted by a rock, the mole has a tilt sensor on board so that the borehole can be reconstructed in a computer model to determine the true depth of the thermometers. Temperature sensors along the tether will record temperatures every hour for at least 400 sols and continue for the life of the mission. The third major exploration of the Martian interior that InSight will conduct does not actually interact with the surface at all. The Rotation and Interior Structure Experiment (RISE) will measure something completely different--the planet's axis of rotation. Before going deeper into how RISE conducts its experiment, let's spend a little time understanding why. Remember how rocky planets like Earth and Mars tend to have layers? Well, those layers aren't uniform. Orbiters have measured fluctuations in the gravity field around Mars. This isn't surprising--the Earth's gravity field is lumpy too, after all. But using what we know about the interior of Earth and the moon, scientists have developed models that attribute these nonuniformities to variations in the thickness and density of the crust or deeper layers. One way to characterize the density distributions in a planet's structure is by measuring how much it wobbles around its axis of rotation. Terminology refresher! Precession is the circular drift of the axis of rotation (think of a spinning top that wasn't perfectly vertical) about a central axis due to gravitational forces acting on the planet, which is not a perfect sphere. The period for a complete rotation of the spin axis is 25,700 years for Earth, but Mars oscillates once every 165,000 years or so. Nutation is the shorter period oscillation that occurs on top of precession. Earth's period of nutation is 18.7 years, while Mars experiences one period of nutation in less than one Martian year. Precession and nutation are observable effects of nonuniformities in a planet's density and mass distributions (moment of inertia) as well as interactions with the gravitational fields of other bodies in space. 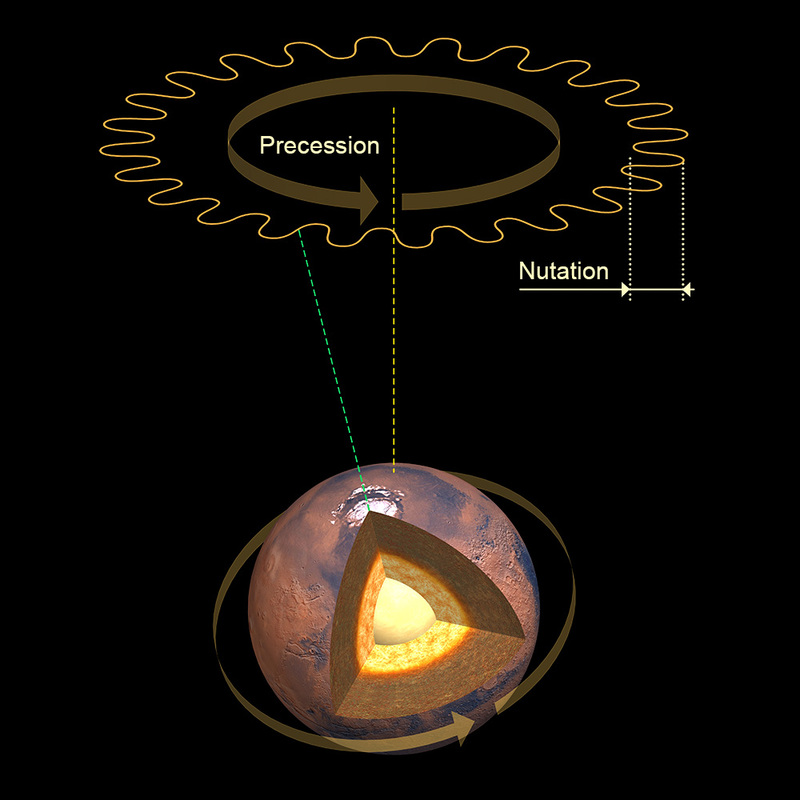 Mars experiences precession and nutation of its axis of rotation. Precise measurement of this "wobble" allow us to measure the planet's moment of inertia. Image credit IPGP/David Ducros. InSight will measure precession and nutation with the RISE experiment as it communicates directly with Earth from Mars using of two medium-gain, X-band (8Ghz) radio antennas. (Most of the data from SEIS and HP3 will be transmitted to Earth via UHF radio and satellite relays, but RISE can also transmit a moderate amount of data on its own). For the experiment, signals are sent from the Deep Space Network ground stations on Earth to the RISE antennas, then sent straight back from the lander to Earth. The frequency of the transmitted signal is known by the sender and measured by the receiver. Since the ground stations and InSight are moving relative to each other, the frequencies of the signals will be different due to the Doppler effect. The speed of light is a constant 3x108 m/s through free space, so changes in frequency are exactly related to the relative velocity between the transmitter and receiver. Since InSight's exact position is also relatively easy to determine from orbit, we can calculate the orientation of Mars's axis of rotation. 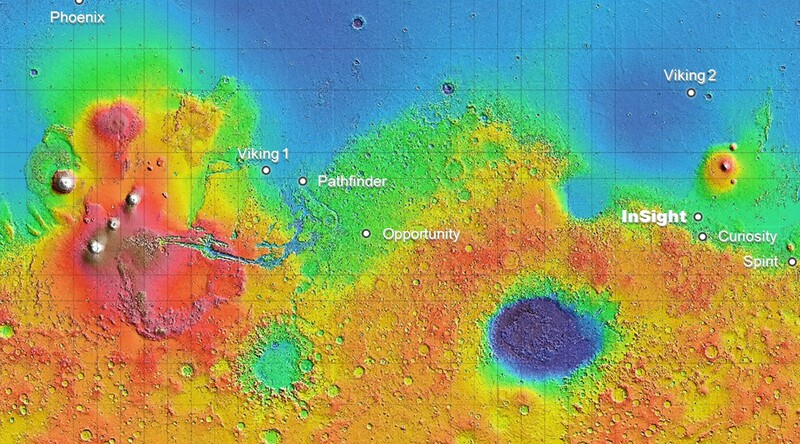 Historically, radio Doppler measurements were taken with Viking in 1976 and Mars Pathfinder in 1997, constraining what we know about the interior of Mars to what we know today. RISE will be be monitored for 2 hours per week over one Earth year to calculate precession and nutation of Mars's axis in much greater detail, 20 years after Pathfinder. In this section we'll discuss the mission operations that lead up to InSight's safe landing on the surface of Mars. Most of the information I'll share with you here comes from the impressively detailed NASA InSight Press Kit. The launch window for this mission opens on May 5 through June 8. This is the time range where the Earth and Mars line up so that the launch vehicle has enough delta-V to get the spacecraft onto the target trajectory toward Mars. It's only feasible to launch at certain times when the positions of the planets line up, otherwise it would take too much energy or too much time to execute. The Earth-Mars transfer window comes around every 26 months, which is why InSight was delayed from early 2016 to this summer. InSight will launch atop an Atlas V rocket from Vandenberg Air Force Base in Lompoc, California. This will be the first interplanetary launch from the west coast in history! But the launch site has nothing to do with InSight's mission requirements. In fact, the spacecraft was originally slated to launch from Cape Canaveral, Florida back in 2016. However, the Cape is used for equatorial (and quasi-equatorial) missions and the launch manifest is packed. There is less demand for the launch pad at Vandenberg, which is typically used for launches to polar orbits (rockets fly south over the ocean rather than west), so it is much easier to "book" a wide launch window without risking conflicts with commercial launchers' schedules. InSight doesn't need to be launched into polar orbit, but the trajectory to Mars is so long that the errors from leaving Earth over one of the poles can be corrected down the line. Atlas V and the Centaur upper stage have the capacity to launch InSight from Vandenberg despite these losses. InSight will have company on it's interplanetary journey! A pair of identical cubesats, together known as Mars Cube One (MarCO) will join InSight aboard the launch vehicle's upper stage. InSight will enter the atmosphere on the far side of the planet during the infamous "seven minutes of terror" as it aerobrakes. These 6U cubesats will act as a relay to bounce the lander's signals around Mars and back to Earth during descent. MarCO's entire journey is part of an experiment. Monitoring how systems behave during the interplanetary voyage is valuable because it will aid future nanosatellite technology development for deep space applications. Image credit JPL. Mars Cube One is is a technology demonstration mission. We don't know what will happen to CubeSats and other nanosatellites in deep space for sure, and one of the best ways to find out is to test it. Both CubeSats in the MarCO mission, MarCO-A and MarCO-B, are identical, and have the same capabilities and objectives. One of the reasons for building them in exactly the same way is in a way a sort of redundancy. CubeSats are too small to have backup systems, and have a high rate of failure relative to larger satellites. Having two systems allows researchers to compare data from two independent sources, which allows them to quantify the variability of the systems' behavior. Plus, if one of the satellites fails outright, they still have another one to continue the journey. 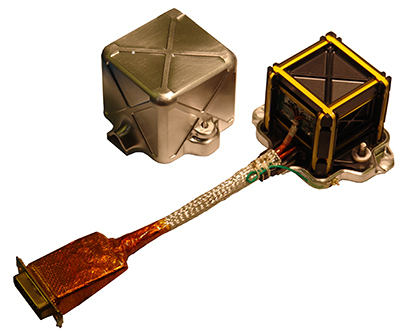 Each MarCO spacecraft is a 6U (30 x 20 x 10 cm) CubeSat with a mass of 13.5 kg. The whole vehicle is essentially a big support system for two primary instruments: a UHF radio receiver (to hear signals from InSight), and an X-band radio transmitter (to talk to Earth). The most prominent feature of the spacecraft is the big X-band reflector array. In this configuration, X-band transponder signals are bounced off the array toward Earth, kind of like a reverse satellite TV dish, to allow downlinks of up to 8 kbps at more than 157 million km away. (It may not seem like much, but remember that this is coming from a cereal box around Mars!) The spacecraft have two deployable solar arrays and a cold gas propulsion system to perform course correction maneuvers (~40 m/s delta-V). Cold gas thrusters will also be used to desaturate attitude control reaction wheels on board. The MarCO spacecraft ride out the launch sequence in a CubeSat dispenser mounted to the aft end (near the engine) of the Centaur upper stage. MarCO is protected during launch by the interstage between Atlas V and Centaur. A few minutes InSight separates from the top of the Centaur upper stage, MarCO-A is jettisoned to the side. The stage rolls 180 degrees to jettison MarCO-B a few seconds later. The CubeSats deploy their solar arrays and antennas then coast along to Mars, checking in with Earth and downlinking information about the health of all on-board systems. When InSight begins its entry, descent, and landing (EDL), it will be on the far side of Mars without the ability to contact Earth, so instead InSight will send out data via UHF radio to MarCO and the Mars Reconnaissance Orbiter (MRO), which will relay information back to scientists on the ground. The InSight mission does not depend on MarCO's success. 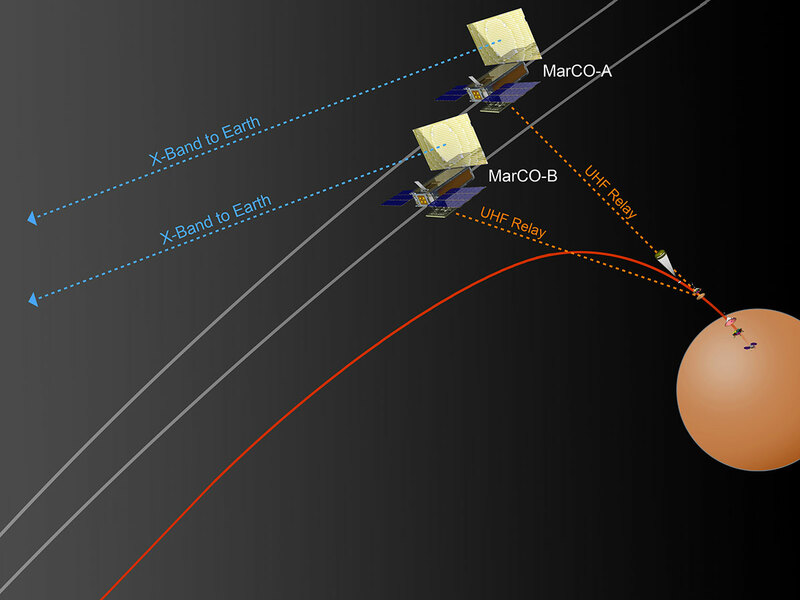 The MarCO spacecraft will continue on into deep space after their close pass with Mars. MarCO-A and MarCO-B were designed, built, and tested in about 14 months using commercial off-the-shelf parts. This mission is the first step toward the idea that SmallSats and nanosatellites could travel with larger craft in similar support roles on these long interplanetary missions... if they make the trip. Like many landers before it, InSight uses aerobraking for the majority of the delta-V needed to touch down on Mars. The lander itself is protected along the interplanetary transit through aerobraking by an "aeroshell" that is aerodynamically stable and fitted with an ablative heat shield. The belly of the lander features a radar altimeter and three clusters of four 300 N hydrazine thrusters for final descent. InSight uses friction from Mars's atmosphere for its initial deceleration, then brakes with a parachute until the lander is just over 1 km from the surface. For final descent, retrorockets on the bottom of the lander deck are fired. InSight will land in an area of Elysium Planitia near the equator. What's so special about this area? Nothing really--and that's the point. InSight's instruments could characterize the deep interior of Mars from pretty much anywhere on the surface, so the decision of choosing a landing site was handed off to the entry, descent and landing (EDL) engineers. InSight will land near the equator in an flat area that doesn't have too many rocks or boulders, to ensure it will land safely and last for a long time on the surface. Image credit NASA. In the words of InSight Principal Investigator Bruce Banerdt, the EDL team was given a "blank slate" in terms of requirements. "Go to someplace that's safe to land, and go to someplace that's easy living," as Banerdt put it during a JPL Public Talk. While it seems logical to place the seismometers close to active marsquakes, you learn more when those quakes travel through the planet than when a sensor is right on top of the quake, according to Banerdt. The minimum mission life is one Martian year, and the rest of the landing requirements are determined by the lander architecture (inherited from the Phoenix mission): The landing site must allow the lander's solar panels to collect enough energy, the site must not be on a steep slope, there must be relatively few rocks and boulders, and the day-night temperatures shouldn't be too extreme. InSight is unusual in that during the landing site selection process all target landing zones identified by the selection committee in 2010 fell somewhere within Elysium Planitia. The final landing site (and a backup) was chosen in January 2015. The regolith in this area is perfect for HP3: dust 1mm thick, with crumbly crushed rock beneath. If the regolith were too fine, HP3 might not be able to dig at all! Troy Hudson revealed an interesting anecdote to us from his testing at JPL, which will be featured in an upcoming episode of SPEXcast. The lander has a 99% likelihood of landing in an ellipse 130 km long and 27 km wide, centered at 4° N and 136° E. InSight's closest neighbor will be Curiosity, which roams around at 4.5° S and 137.5° E.
InSight is a long time in the making, and it shows. Even the science it will conduct require patience. The technology and engineering that went into developing these instruments is fascinating. There’s more to InSight than what you see on the surface (pun intended). Thank you for coming along for the ride! For more information about every aspect of this mission, I emphatically recommend reading NASA's press kit. InSight is fitted with even more instruments that I didn't get to discuss in main body of this article. I've included brief summaries, images and links to further reading below. SEIS and HP3 are deployed with the Instrument Deployment System (IDS). The IDS is a robotic arm, grapple, and camera. It moves slowly and is given commands by operators on Earth, who will spend time assessing and planning each movement from the camera. The process isn't automated because scientists need to choose the best locations to place these experiments and ensure both have good surface contact in order for them to operate effectively. The IDS uses shared heritage from the Phoenix lander's robotic arm. An engineer handling the protective cover of the instrument deployment camera during testing of the IDS. Image credit NASA/JPL-Caltech/Lockheed Martin. A close-up of the grapple, instrument deployment arm, and SEIS. Image credit NASA. The Auxiliary Payload Sensor Subsystem (APSS) is a collection of instruments used to measure the lander's surroundings. InSight Fluxgate (ISF) will be the first magnetometer to reach the Martian surface. 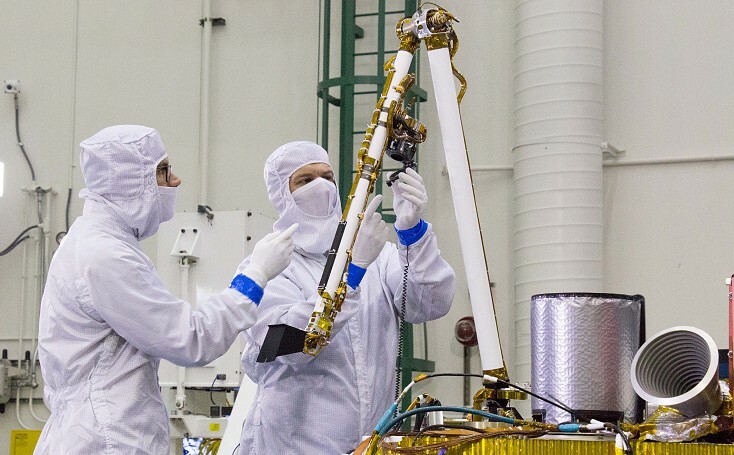 Two weather sensors make up the Temperature and Winds for InSight (TWINS) payload, which will characterize the weather at the launch site, especially winds, temperatures, and pressures, at 2Hz. One station is mounted to the lander deck while the other is mounted just behind the camera on the Instrument Deployment Arm. A barometer sensitive enough to record pressure changes on the order of 10 µPa is mounted on the underside of the WTS. This "extra" data will be correlated with the measurement noise from the SEIS experiment, and may help quantify their impact on seismometer measurements. InSight Fluxgate has a sensitivity of 0.1 nT. Image credit UCLA. In addition to supporting InSight's measurements, the APSS will help improve our understanding of Martian climate and weather. Image credit NASA. Laser RetroReflector for InSight (LaRRI) is an array of eight retroreflectors supplied by the Italian Space Agency. The retroreflectors are an arrangement of 3 perpendicular mirrors which are able to shine back much of the incident light if illuminated by a laser. 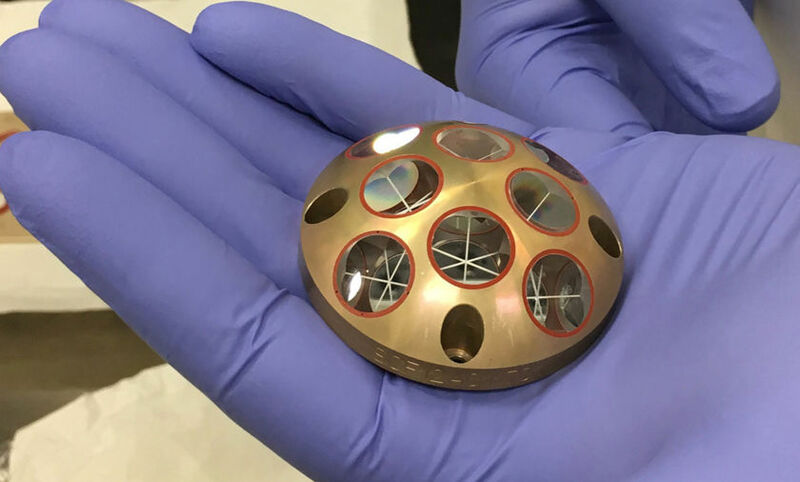 While LaRRI won't be used as part of InSight's experiments, it will provide passive science value for future orbiters equipped with a laser altimeter. Check out our interview with Troy Hudson, Instrument Systems Engineer for Mars InSight. Out Now!